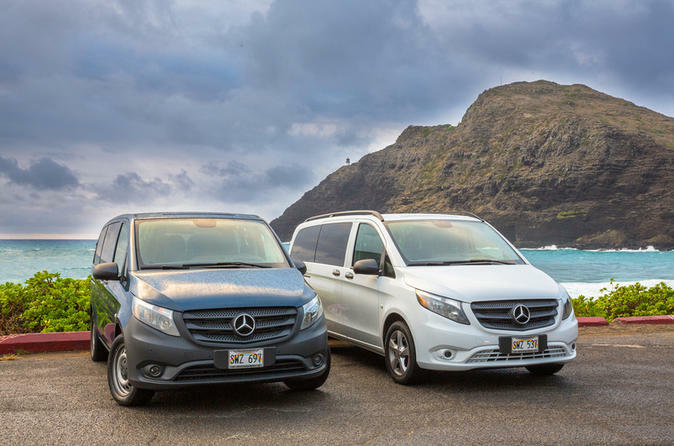 Experience Oahu through the eyes of an expert private guide who will provide a local insight about the island culture, history, nature and wild life all in the comfort of our new Mercedes Mini Vans. All our vehicles are new, air-conditioned, Mercedes Metris. They fit up to 7 passengers and in case your group is larger than this, a second vehicle is always available to accompany the tour. This is a pleasant and delightful touring activity in a VIP Style Aloha inspired service all customized to your time and preference. You will always see the picturesque beauty of Hawaii regardless of where you go to but with our tour, you will experience a private, high end and impeccable service, pleasant conversation and comfort of enjoying a day on the island without having to worry about directions or time. Our VIP Private Island Tour will be carefully crafted to give you lifelong and unforgettable experiences in this tropical paradise - Aloha filled attention and hospitality. We will tailor to your specific individual, couple, family or group needs. Some recommended sites; Dole Pineapple Plantation - the world’s largest maze, Green World Coffee Farm, Diamond Head Crater State Monument, Kualoa Ranch - Private Nature Reserve, Haleiwa Town North Shore & Famous North Shore Surf Points, Sea Life Park Hawaii, Makapu'u Point State Park, Pearl Harbour - National WWII Museum, Punchbowl Cemetery- National Memorial Cemetery of the Pacific, Byodo-In Temple Valley of the Temples Memorial Park,Hālona Blowhole . Snacks and refreshments are included in this tour.